Beaches, beaches and more beautiful beaches! Parks, outdoor concerts, boating, scuba diving. 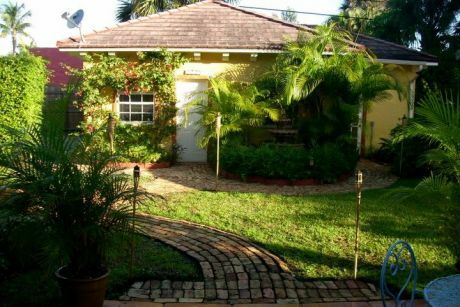 This beautiful Mediterranean home is located in downtown West Palm Beach. Two blocks from the intra coastal waterway. The weather in Florida is such a gift. Come,relax, take a breather, warm your body and soul by the enticing tropical pool and lush private garden. 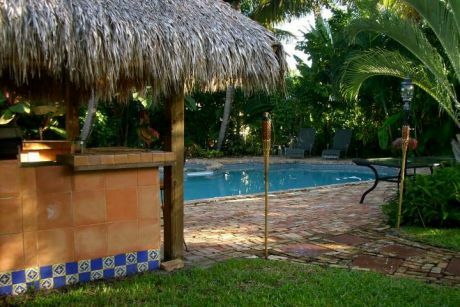 Check your emails lounging by the outdoor garden pool, next to the Tiki Bar, while you watch TV or simply sit back and listen to music. The outdoor garden pool is surronded by Palm trees and tropical foliage. Enjoy the perfect night time entertainment watching the beautiful moon on a warm breezy night as you sip a glass of champagne, enjoying the warm Florida air. 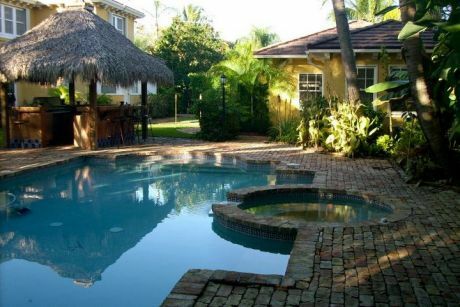 Swaying Palm trees await you in this inviting home with its large outdoor garden pool and jacuzzi, large tropical garden and best of all the enticing Tiki Bar with BBQ, TV, Fridge and outdoor music system. This home offers 4 bedrooms and 2 1/2 bath in the main house and an additional 1 bedroom and 1 bath in the guest house. The quest house also has a fully equipped kitchen with washer/dryer and could accommodate 2 additional people. The cottage provides 2 twin size beds and a queen size sleeper in the sectional sofa. All linens and towels will be provided. If you would like additional pictures, please ask about the picasa public web album on google. WHEN TO GO: Year round – Palm Beach’s average temperature is 75 degrees. WHAT TO DO: Explore 47 miles of sandy beaches. Enjoy 7 shopping districts. Stroll the Norton Museum of Art. Bike around Peanut Island. DINE IN OR OUT: Sample the local seafood. Crab cakes. Conch chowder. Tuna, sailfish, marlin. FAMILY FRIENDLY: Palm Beach Zoo. Calypso Bay Water Park. South Florida Science Museum. Lion Country Safari. OUTDOOR FUN: 150 golf courses. 1100 tennis courts. Scuba, snorkeling. Kayaking, sailing. Sports fishing. 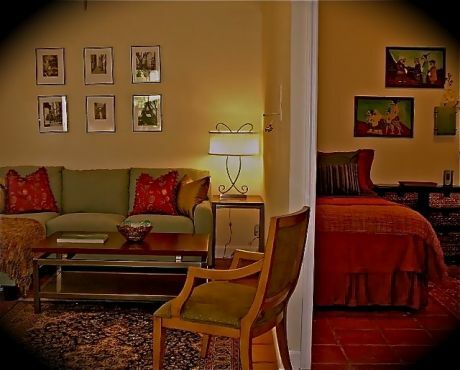 Vacation Rental Amenities This home offers ambience and relaxation the moment you walk in. The living room offers plenty of room to relax in with a large, plasma TV with DVD. Adjacent is a beautifully furnished office with DSL connection. 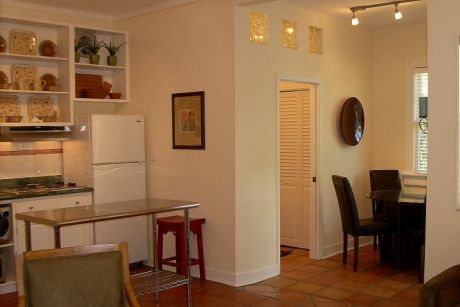 Downstairs you will also have the marble top kitchen, original butlers pantry, dining room and laundry room. French doors will lead you to the pool area. On the second floor you will have all the bedrooms. The bathroom is en suite. 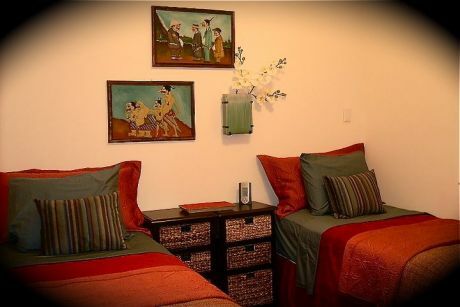 Two bedrooms share a jack and jill bathroom and the fourth is a large comfortable bedroom. Additional services can be provided, please ask for the listing and prices. Housekeepers, chef services, airport pickup, in house masseuse, etc. Let us know what you might fancy and we will do our best to accommodate your vacation in paradise. Activities and Attractions Beaches, beaches and more beautiful beaches! Parks, outdoor concerts, boating, scuba diving. Shopping on Worth Avenue. Fabulous restaurants! City Place with more great stores and restaurants. Pier to the Palm Beach Princess is very close. Hop on for a mini cruise, or head to South Beach 1 1/2 hours away. A private car can always be arranged. Disney World is just 2 1/2 hours away and well worth a day trip. Ft. Lauderdale only 1 hour away is also a great day trip. Delray Beach, just 30 minutes away offers great ambience at night with some really great restaurants and great beaches during the day. Fancy playing tennis for the day head to many wonderful parks nearby. The world renowned Breakers is also close by. They offer a great family restaurant,and great brunches on Sunday. The amenities are endless. This is truly a wonderful vacation with many, many options available or you can simply lay back and relax. Just let us know and we will try to help you. The property will accommodate a maximum of 8 people. Exceptions can be made, with prior approval, to accommodate a maximum of 10. If you have a party larger than 10, please enquire about other properties that are within walking distance from the property. No Exceptions will be made. Cleaning fee $175.00 One week minimum rental. A security/reservation deposit is required to secure reservation. Forms of Payment. Credit cards, PayPal, Cashiers Check. House note: The guest house is available as a separate rental. Other: Credit cards, PayPal, Cashiers Check.